Peter Darman presents the third book in the Parthian Chronicles series. 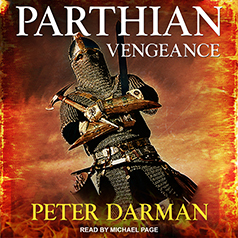 Parthian Vengeance is the third installment in the Parthian Chronicles, the adventures of King Pacorus of Dura, and follows on from Parthian Dawn. Once again Pacorus gathers his faithful companions around him for the life-or-death struggle with the treacherous Mithridates and the ambitious Narses—Domitus, the ex-Roman centurion and now general of Dura's army; Gallia, his fierce warrior queen; Orodes, the landless prince; Prince Malik of the Agraci; and Surena, destined to become one of the greatest Parthian commanders of all time.